I love to cook, but I wasn’t born a good cook. It’s a skill that I’ve practiced and grown to enjoy. I also love all different types of cuisine—Mediterranean, Italian, Chinese, and a good American cheeseburger. My mother, on the other hand, was a talented cook. She could taste a dish, then replicate it without a recipe. My parents owned a restaurant for thirty years and food was an important part of our family. I’d often come home from school to the delicious aromas of simmering grape leaves, stuffed peppers and tomatoes, and shish kebab. As for me, I have fond memories of watching my mother in the kitchen. I’d stand by her side with a pen and paper in hand and scribble detailed notes. She never used a recipe. I’d ask, “How much of that?” She’d say a handful or a pinch. It drove me nuts! Our handfuls were not the same. Years later, my mother passed away. When I try to prepare her dishes, they never seem to come out just like hers. Maybe it’s the memory I’m holding onto more than the taste of the food. But I am writing down my recipes for my two young girls. No more handfuls or pinches of anything. If my girls decide to make a dish, then I’d like them to have a recipe to follow. 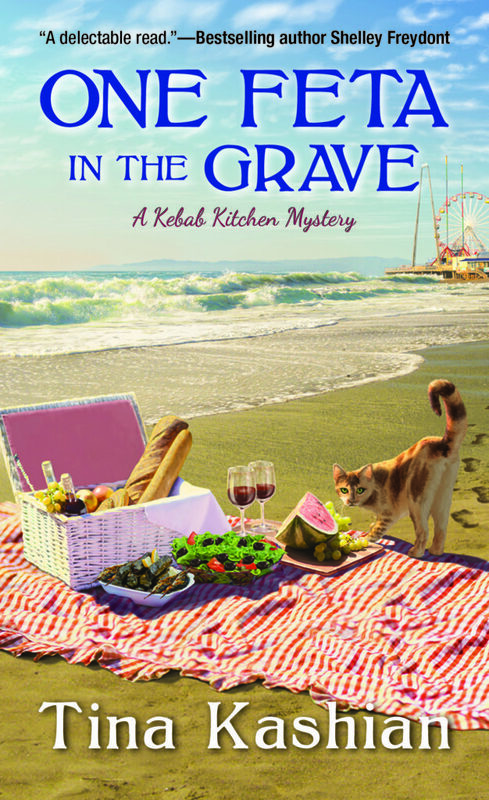 I’m excited about the release of One Feta in the Grave. Here’s a blurb about the book.